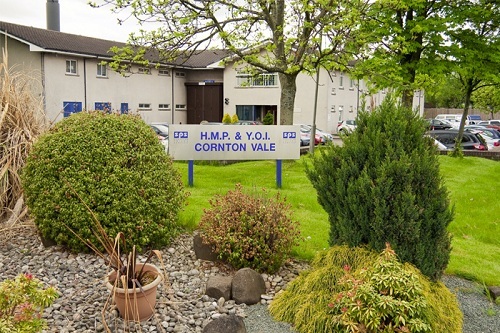 HMP YOI Cornton Vale is the national facility for female offenders for both remand and convicted prisoners. Cornton Vale has the design capacity to hold a maximum of 119 prisoners, along with a separate Mother and Baby Unit with 7 spaces. There are two house blocks, Ross and Peebles Houses as well as 18 spaces in our Independent Living Units in the community. Cornton Vale will receive admissions from court and prisoners will be transferred to other establishments who hold females, Edinburgh, Greenock and Polmont. Grampian is the only other establishment who will receive admissions direct from court to service the northern areas of Scotland. Once you are in Bridge of Allan, turn right into Fountain Road (opposite the Royal Hotel). Proceed down Fountain Road, past the Fire Station and over the railway level crossing. Cornton Vale is 400 yards past the crossing on the right hand side. Parking is limited at Cornton Vale. There are a few spaces at “The Family Hub”, if there are no spaces left, the main car park is situated to the rear of the prison. There are disabled spaces in the Family Hub car park and also in the main prison car park outside the main gate. The bus and railway stations are located in Stirling, near the City Centre. The bus station is 200yds to the left when you exit the railway station. The 53 and 54A buses stop right outside the prison; the journey takes approximately 10 minutes. Taxis are available outside the train station; a taxi fare is approximately £4. Contact Traveline Scotland on 0871 200 22 33 or www.travelinescotland.com for accurate, up to date travel information. Those individuals who are on remand are entitled to one visit daily Monday to Friday and also one at the weekend. The Women who are convicted are entitled to not less than 2 hours in any period of 28 consecutive days. Each of those visits will last an hour. Visits are booked by the women who are in our custody, who in turn will notify their visitor of day and time allocated. At each visit there is a maximum of 3 adult visitors, this does not include children under the age of 16. Agents must phone the prison on 01786 832 591 ext 5209 then pick the visits option when prompted. The visit team will book a time slot (see below for options) and on arrival solicitors and agents must produce a valid law society card or professional credentials (in the case of social workers). Information can be found below on legal visits by video link. Children's visits are for young people and children under the age of 18 to enhance their relationship with the individual in custody in a relaxed environment. Prisoners who can demonstrate an established relationship (for example grandparent, non-married partners etc) with any Child/Young Person can access these visits, children under the age of 16 must be accompanied by an appropriate adult. (Having regard to any Child Protection Issues). These visits will take place in the visit room and all offenders can access these visits. Then the Monday after will go back to week 1 and so on. The Family Hub at Cornton Vale is managed in partnership with the Interfaith Charity consisting of mainly volunteers and SPS staff. The Hub provides meaningful support for families affected by imprisonment, visiting a friend or relative, offering a welcoming and supportive environment, especially for first time visitors who are unsure of prison procedures. The Hub provides light refreshment such as tea, coffee juice, biscuits and fresh fruit any donations are much appreciated. There is an inside and outside play area for children (children must be supervised at all times by the guardian). There are lockers for personal belongings that are not permitted into the visit room. You will need a £1 coin to operate the locker which is refundable, though tokens are available (just ask member of staff or volunteer). Toilet facilities including disabled access along with baby changing facilities are available. Everyone attending the prison for a visit must book in at the Family Hub, at least 30 minutes before the visit session starts. This is to allow sufficient time to process your details and walk the short distance to the visits room. An officer will take your details then book you in for the visit. You will require your identification for each visit. If you have a baby with you, you can take essentials into the visit, such as a change of nappy, baby wipes baby bottle with milk – no baby food is permitted. You are only allowed to take change (coins) and your locker key into the visit room. If you require medication such as an inhaler please disclose this to the officer in the Family Hub where you book in. All other articles have to be placed into the locker. You will be escorted over to the main building by an officer, on entering the main door of the prison, you will be greeted by prison staff at the front desk. You will be processed through security checks, by the staff. Any belongings that have metal have to be placed in a tray and processed through the x ray machine. Visitors will be asked to walk through a metal detector and given a rub down search by a member of staff. At times, there may be the SPS Dog Unit operating at the visits – it’s nothing to worry about and you will be given instructions by the staff. If you have any concerns at all – please talk to a member of staff. Visitors will proceed up the stairs into the visit room. Visitors will be asked to take a seat and the women will then be brought in. At the end of the session prisoners will leave first then visitors will be asked to leave. The visit room has vending machines for anyone wishing to purchase any refreshments, such as tea, coffee, juice, crisps and chocolate. There is a children’s play area, which again is unsupervised and it is the guardian’s responsibility. Property and cash can be handed in here, if there are no evening visits then property and cash can be handed in to out Front of House area at HMP Cortnton Vale. Cash can be handed in here for prisoners in other establishments. An officer will be in the family help hub 09:30-12:00 and 13:30-16:00 and then alternating days at 18:30-20:30. All outside agencies that wish to come in to visit a person in custody has to be registered, to do this they need to email us with a company letter headed email. - The agency type e.g. legal, social work, medical, police or community. - The name, address and phone number of the company/employer. - The visiting agents forename and surname. Please note upon booking a visit, the name and prisoner number or D.O.B will be required to book a visit successfully. Any personal items such as phones, dictaphones, laptops, video or audio equipment are strictly prohibited, items that are of business use may be authorised through the SPS UNDER CERTAIN CIRCUMSTANCES if it is relevant to the visit and person being visited. Application must be made to the Head of Operations in advance to allow time to process. You can post in property for the women with the appropriate completed pro forma which has been posted to the visitor. To ensure the parcel arrives safely, you can send it recorded delivery (cost incurred at the Post Office). You can post money into an offender for their PPC, however we strongly recommend either recording/special delivery (cost incurred at the Post Office) when posting cash or you can post a cheque or postal order (again there is a cost incurred at the Post Office for the order) in. Both of these should be made payable to the Scottish Prison Service, but please add the offender's details on the back of the order or cheque.